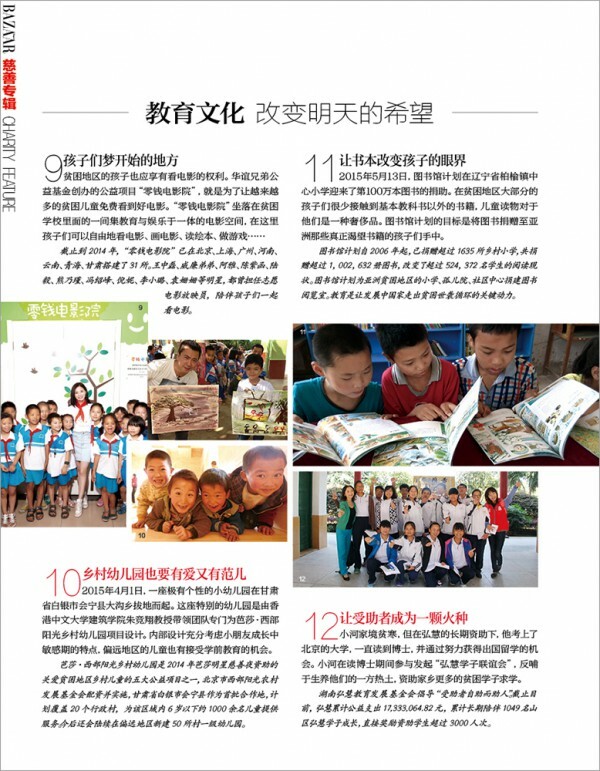 The Library Project is honored to be mentioned in Harper’s Bazaar (China)‘s annual Charity Feature. I’d like to thank everyone at Harper’s Bazaar for helping us raise awareness about rural literacy in China. Also, this could never have happened without the continues support of the Park Hyatt Beijing and them introducing TLP to Harper’s Bazaar. This year’s Charity Feature showcases many wonderful organizations doing great things in China, the majority of them being Local Non Profit Organization. We’re all honored to be one of only two International Non Profits that made their list. Check out the cover below with the always beautiful Fan Bingbing and Li Chen, along with a few pages from the Harpers’s Bazaar Charity Feature below.